PARIS - Distraught Parisians and stunned tourists gazed in disbelief on Monday as a monstrous inferno tore through Paris' Notre Dame cathedral, one of the world's best-loved monuments. Thousands of onlookers lined bridges over the Seine and along the river's embankments, held at a distance by a police cordon as the blaze engulfed the cathedral's roof. As dark fell over the French capital, orange flames rising through the heart of the 12th century Gothic cathedral cast an eerie glow through its stained-glass windows and against its stone towers. Dumbstruck observers stood rooted to the spot as the scale of catastrophe sunk in, questioning whether the cathedral would survive the night as clouds of acrid-smelling smoke rose into the sky. Some were visibly moved. 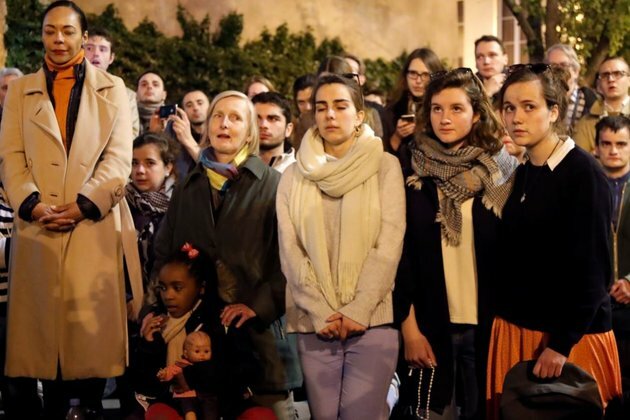 'It will never be the same' said 30-year-old Samantha Silva, tears welling in her eyes as she explained how she would always take foreign friends visiting Paris to the cathedral. Built over a century starting around the year 1160, historians consider Notre Dame to be among the best examples of French Gothic cathedral architecture. Notre Dame survived being ransacked by rioting Huguenots in the 16th century, pillaging during the French Revolution of the 1790s and being left in a state of semi-neglect until Victor Hugo's 1831 novel 'The Hunchback of Notre Dame,' which led to renewed interest in the cathedral and a major restoration which began in 1844. The cathedral continued to be used as a place for national mourning in modern-day France. World leaders attended memorial services held for former presidents Charles de Gaulle and Francois Mitterrand. 'It's horrible, it's 800 years of history gone up in smoke,' said German tourist Katrin Recke. As fire-fighters raced to save priceless artworks, centuries-old gargoyles and the cathedral's northern tower, world leaders expressed sorrow and grief in messages to the French people. 'Notre Dame belonged to all humanity. What a tragic spectacle. What horror. I share the French nation's sadness,' tweeted Jean-Claude Juncker, president of the European Union's executive Commission. Get a daily dose of Nashville Herald news through our daily email, its complimentary and keeps you fully up to date with world and business news as well. Publish news of your business, community or sports group, personnel appointments, major event and more by submitting a news release to Nashville Herald. © Copyright 1999-2019 Nashville Herald. All rights reserved.